Because YOU demanded it – The Origin of the Super Pimps! Where does Blackbeard’s sentient hair come from? What transformed Foxy Mama into the lupine lady of the night? How did Ghetto Blaster build his fantastic 8 Track Suit? The answers to these and other quintessential questions lie in the strangest decade ever: the 1970s! And tragedy strikes when Darquefire springs his trap on the Urban Revengers with fatal results! 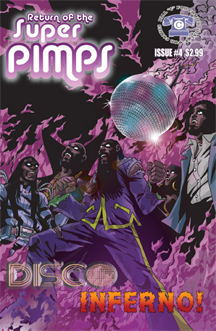 This entry was posted in Featured, Store and tagged buy comic books, dial c for comics, indie comics, RETURN OF THE SUPER PIMPS, richard hamilton, superhero comics. Bookmark the permalink. Follow any comments here with the RSS feed for this post. Post a comment or leave a trackback: Trackback URL.